Terry Crews spent his Sunday morning tearing into comedian D.L. Hughley. Hughley finds it hard to believe that a man as muscular as Crews couldn't stop someone from trying to touch him inappropriately. In September of 2018, Crews settled a lawsuit against his former agent, Adam Venit, who he claimed groped him during a party back in 2016. The actor came forward with the allegations during the height of the #MeToo and Time's Up movements, receiving praise for publicly sharing his story of sexual harassment in the entertainment industry. In a recent interview, D.L. Hughley discussed Terry Crews' sexual misconduct allegations and found them hard to believe. Specifically, the comedian noted that God gave Crews "muscles so that he say no." The actor must have recently discovered the interview because he's pretty angry about it now. After suggesting that Crews should have gotten physical with Adam Venit, the Expendables actor shot some angry tweets towards Hughley. Crews had this to say. "Sir you said I should have pushed him back, or restrained him and I DID ALL THOSE THINGS... but you act like I didn't. Were you there?" This is an argument that has been made many times before. People assume that since Terry Crews is a man with muscles, that he should have beat the hell out of Adam Venit. D.L. Hughley responded to Crews by saying that his actions were different from "slapping the sh*t out of him." Crews was angered even more by what Hughley came back with concerning this incident of sexual misconduct and had the perfect response, which you can read below. "So sir... If you truly feel that is a correct way to deal with toxic behavior... Should I slap the sh*t out of you?" Terry Crews took a step back after that and then revealed how much he had looked up to D.L. Hughley early on in his career. Had Crews followed the physical advice of Hughley and others, he might have ruined his career. We more than likely would have seen headlines shouting that the actor assaulted a famous producer for no reason, which would have ended up destroying him in the long run. Crews decided to tell Hughley how much his words hurt his feelings. He explains. "I have looked up to you my whole career as one of the funniest most talented people I've ever seen. I remember when I saw you warming up the crowd at Fresh Prince of Bel Air and I thought this man is a genius. But now you are an example of when comedy turns to sarcasm and cynicism. And you find it extremely easy to get jokes at someone else expense. You mock my success, but all I ever did was support you... ABUSERS PROTECT ABUSERS but they MOCK SURVIVORS as well. When you see me, keep it moving." D.L. 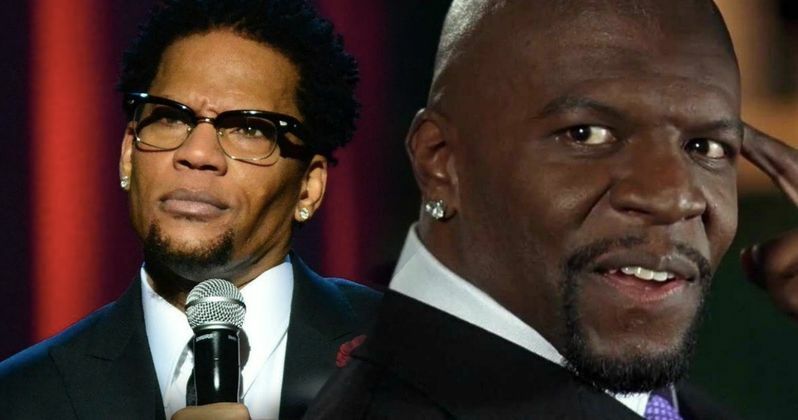 Hughley has yet to respond to Terry Crews or offer any kind of apology and he might not, though he did "thank" the actor. The comedian is entitled to his own opinion, but Crews doesn't want to have anything to do with him anymore, which is understandable. Social media seems to be divided on the social media altercation with several people taking on both sides. You can check out the video that started everything below, and then the responses, starting with Terry Crews' Twitter account.